The final hand is dealt in the $400 Mega Stack, in which Terrence Hinchliffe wins a race against 2nd place finisher Mike Nye. Terrence wins $25,18, the title, and the trophy. 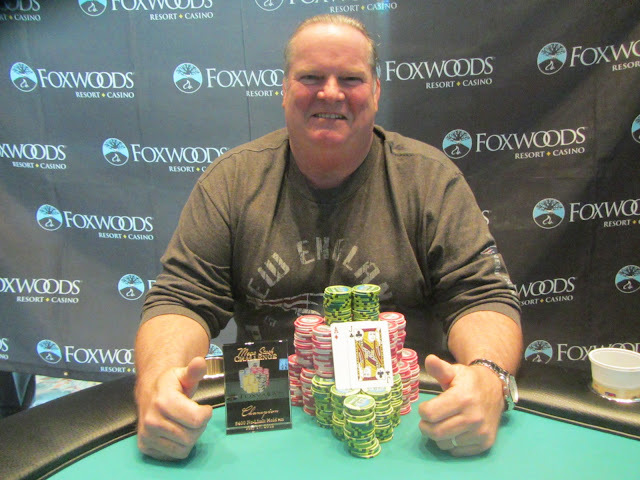 The final hand was a race between Terrence Hinchliffe, who had a massive chip over his opponent Mike Nye. The flop was favorable for Mike when it fell [6s][9d][8d]. The [6d] turn gave Terrence a backdoor flush draw to go along with his two overs. 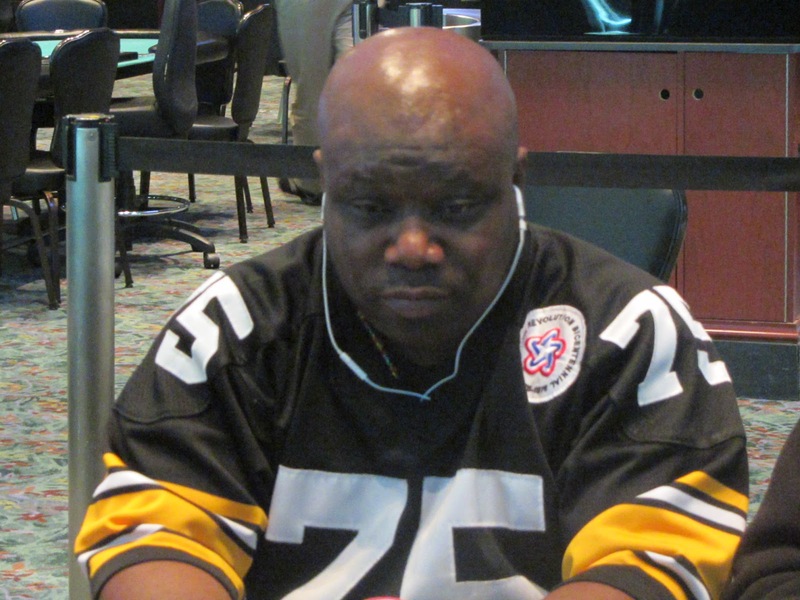 Continuing to run well, Terrence hit the [4d] to make the flush and win the $400 Mega Stack. 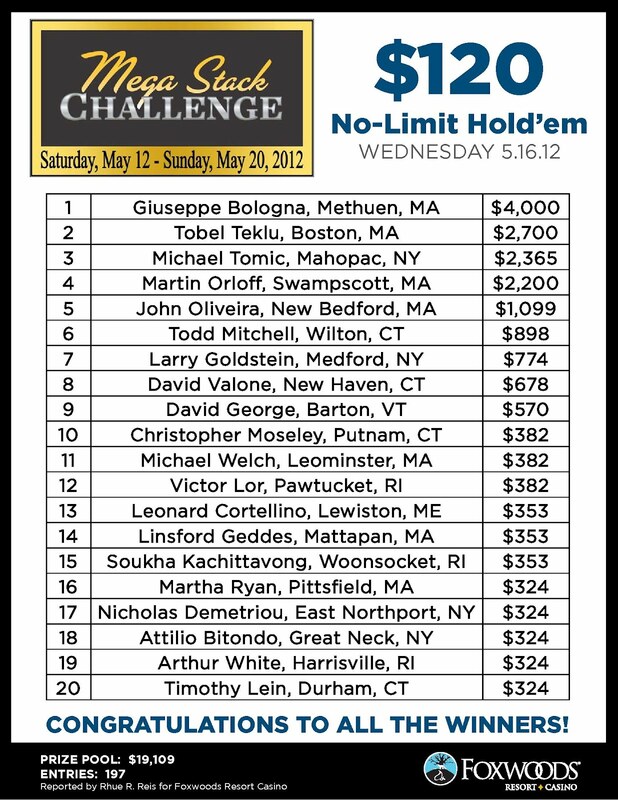 Terrence will collect $25,182 as well as the trophy and the title for his amazing final table performance. 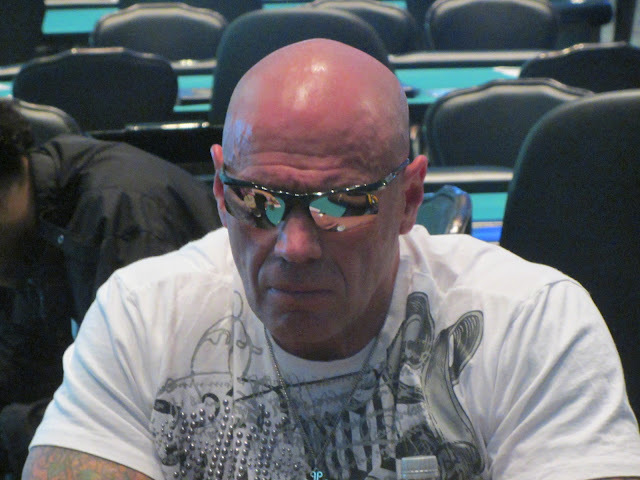 Terrence Hinchliffe raised preflop before Nikki DeFrancesco moved all in. Terrence made the call with [Qc][Js], and was a slight underdog to Nikki's [Ac][9h]. Lady luck continued to smile upon Terrence when the flop fell [9s][5c][Jd]. The [8s] turn changed nothing, and Nikki would need to catch an ace or a nine to survive. It was not to be, as the dealer peeled off the [2d] on the river. Nikki will earn $9,291 for her 3rd place finish. 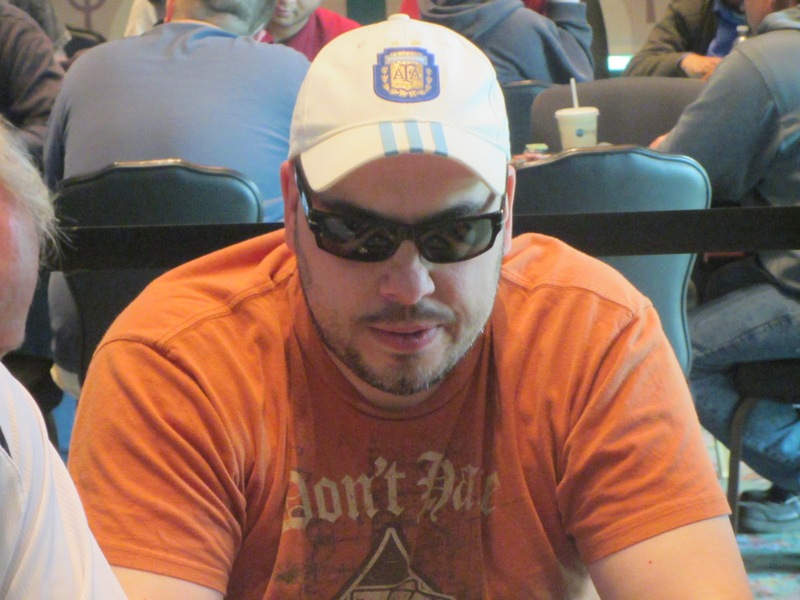 Walter Warot was all in on a [Th][7h][Ts][Ac] holding [Ad][4s]. 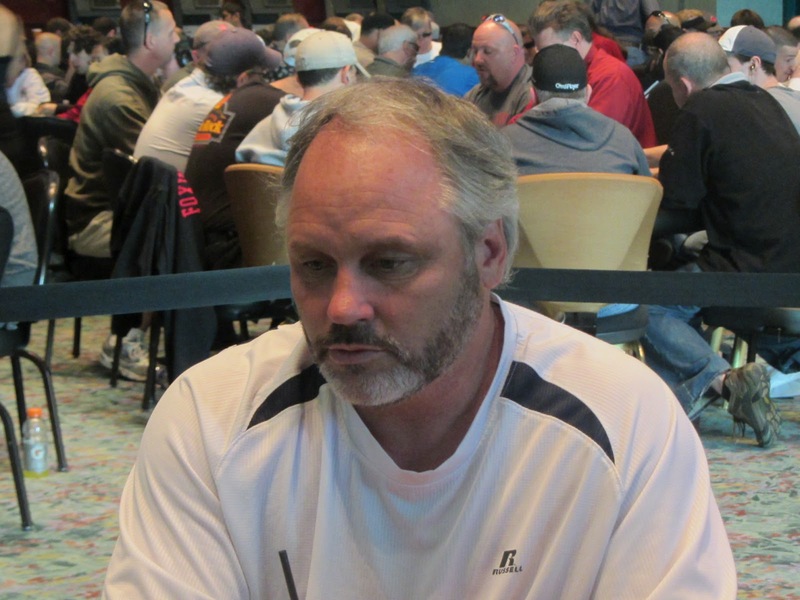 Unfortunately for him, Terrence Hinchliffe had flopped trips with his [Td][3d]. Walter would need one of the two remaining aces to survive, but the [5h] hit the river to eliminate Walter in 4th place. He will earn $7,444 for his efforts. After taking a bad beat the previous hand to Mike Nyte, Silvio moved all in on the button and was called by Nikki DeFrancesco in the big blind. Silvio had live cards with the [9d][8h] against Nikki's [Ah][7d]. Nikki's hand was ahead through the [Ad][Qs][Ts] flop, but Silvio did pick up a gutshot straight draw. That draw failed to materialize on the [5h] turn and [7s] river, and he will exit this tournament in 5th place. He will earn $5,807 for his efforts. 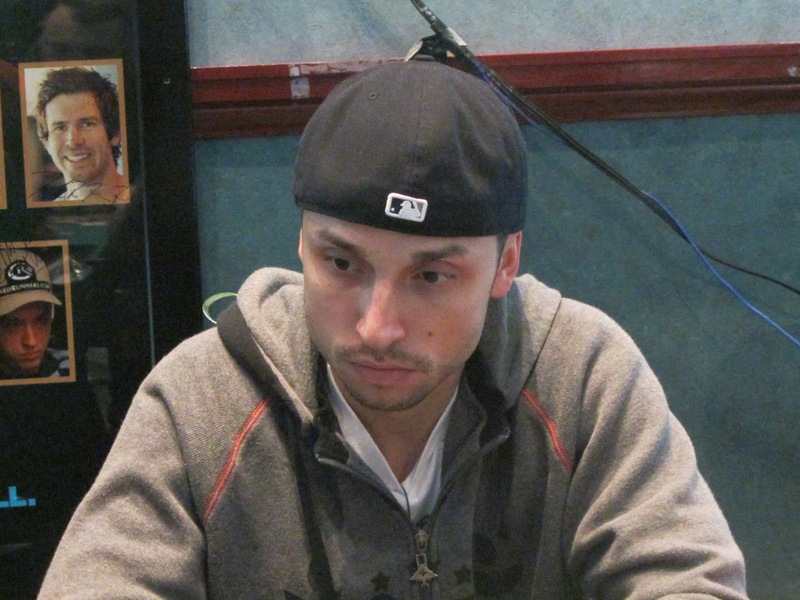 Mike Nye moved all in from the button, and Silvio Mantuano made the call from the small blind. Mike was dominated with [Tc][9c] against Silvio's [Ad][9d], but Mike seemed to have confidence in his hand. After asking the dealer to rearrange his cards so the ten was closest to the flop, Mike flopped two pair on the [Ts][9s][Jc]. The [7d] on the turn left Mike dodging an 8 to chop or an ace for a bigger two pair. When the river fell the [7h], Mike escaped elimination and doubled up to approximately 1.5 million. Tony was going to need a five to survive. Unfortunately for him, the flop fell [Ah][Th][3d], leaving Tony drawing to runner runner. The [Qc] on the turn left him drawing to one of the three remaining queens to chop the pot. 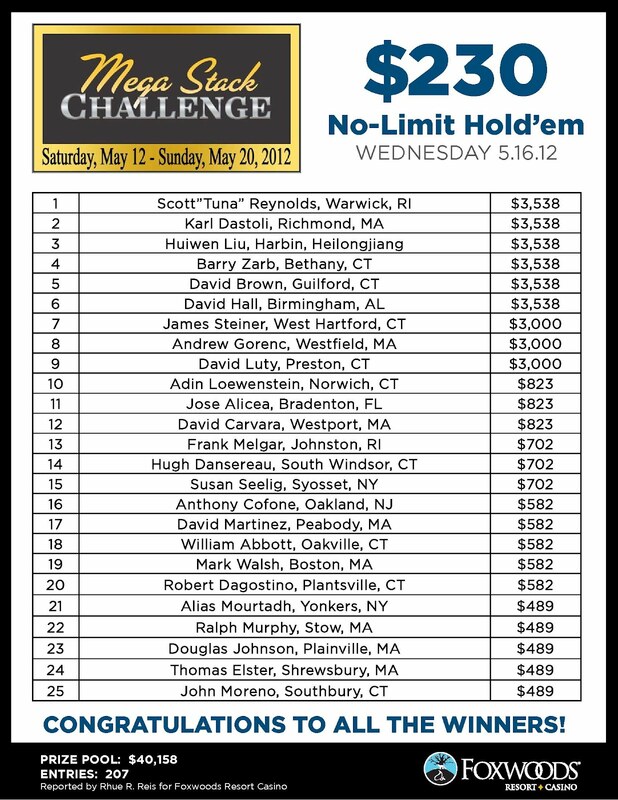 But the [Jh] hit the river, sending Tony to the rail in 6th place, good for $4,699. 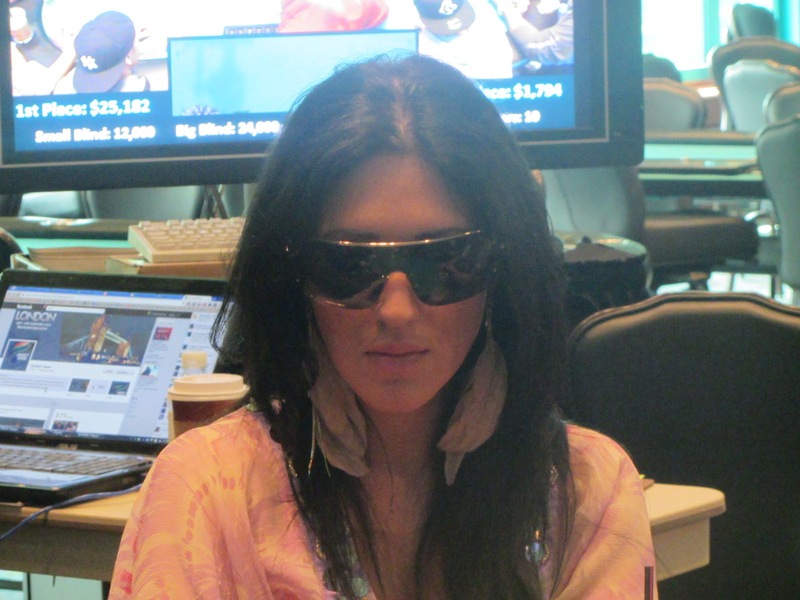 Terrence Hinchliffe raised preflop on the button before Nikki DeFrancesco moved all in. Terrence made the call holding [As][Jc], but Nikki was in great shape with the [Ah][Qs]. Everything changed on the [6h][Jd][6d] flop, and Nikki was now drawing to a 3-outer. She didn't have to wait long, as the dealer peeled off the [Qd] on the turn. Now Terrence needed a 2-outer to eliminate Nikki. The [Kd] on the river left Nikki holding the winning hand, and she will double up to almost 700,000. 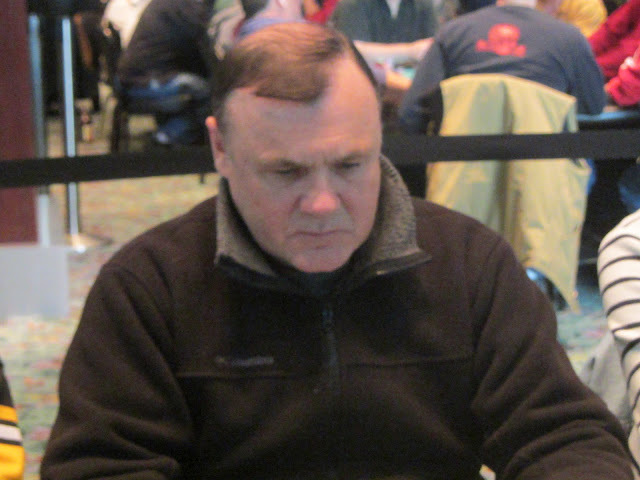 Floyd Overton was all in preflop holding the [Ad][Qh] against the [Kh][Js] of Tony "Muscles" Campagna. Tony smashed the flop when it fell [Jc][Jd][Td], and Floyd was left drawing to runner runner queens or aces to make a full house (a king would make Floyd a straight, but Tony would make a full house). The [7c] turn left Floyd drawing dead, and the meaningless [4d] on the river left Floyd heading to the payout desk to collect $3,906 for his 7th place finish. After Terrence Hinchliffe raised preflop, Isaiah Cannata moved all in. Terrence made the call holdind [Ah][Ac], which had Isarah's [Kc][Qs] in pretty bad shape. Isaiah had hope after the [Jh][Ks][2h] flop, but failed to hit two pair on the [7h] turn or [5c] river. Isaiah will earn $3,168 for his 8th place finish. 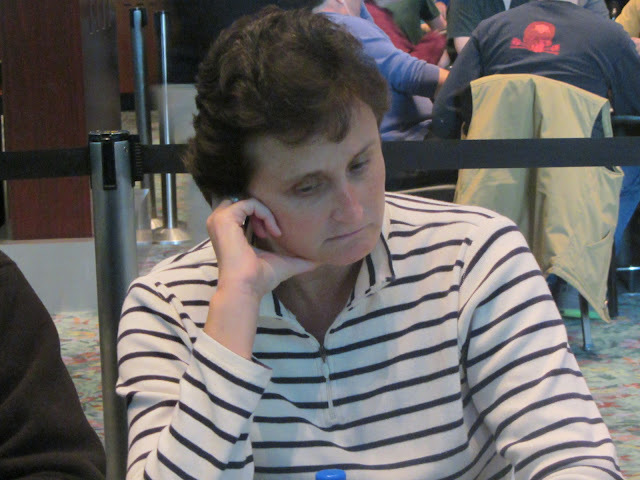 Nikki DeFrancesco got the last of her stack in with a shove on the button and was called by Tony "Muscles" Campagna. Tony had made the call with [Qs][9c], but Nikki woke up with a hand as she held the [Ad][Qc]. Both flopped a pair on the [5h][9s][Ac] flop, and no two outer came on the [3h] turn or [7h] river. Nikki is still short stacked, but she is still in the game! Terrence Hinchliffe was all in preflop holding the [Ad][Ac] against the [As][Qs] of Nikki DeFrancesco. Terrence's aces held up to double him to over 1.1 million, while Nikki is left with just over 100,000. On a flop of J-8-3, Regina Brown was all in holding the A-J and was up against a set of treys. Regina did not hit her miracle full house, and she will exit this tournament in 9th place, good for $2,604. Nick Bennett pushed the last of his short stack in preflop with K-J and was called by pocket aces. 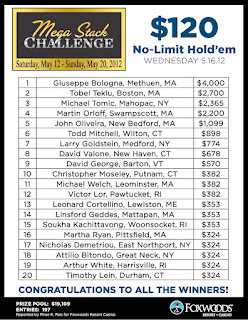 Nick did not improve and will exit this tournament in 10th place, good for $1,794. You can watch the tournament live at www.FoxwoodsLive.com. Players are on a 10 minute break while the tournament staff does an official chip count of the final table. Seating assignments and chip counts will be posted shortly. Cards are in the air for day 2 of the $400 Mega Stack. 22 players remain, and the field is now playing 8,000/16,000 blinds with a 2,000 ante. All players are guaranteed $939. With 22 players remaining, play has concluded for the night. The tournament staff will redraw the players into their new seats, and they will return at 12pm EST. Chip counts and seating assignments will be posted shortly. With 27 players remaining, the blinds have gone up to 6,000/12,000 with a 2,000 ante. This will be the last level of the night. Remaining players will then bag up their chips and return at 12pm EST to play down to a winner.